As I plopped down in my office chair day after day, I started to hear a 1980s-esque newscaster in my head: “Your desk may be trying to kill you. Film at 11.” I’ve read one too many articles about how leading an overly-sedentary life can have negative long-term health implications, and for years I’ve spent all day long sitting in front of my trusty iMac. Was my professional life shortening my actual one? After looking at yet another study with scary statistics (“Sedentary living is responsible for about one-third of deaths due to coronary heart disease, colon cancer, and diabetes”), I made an impulsive decision to convert my workstation to a standing desk a couple months ago. The author’s desk uses tables, shelf-toppers, and even the complete works of Shakespeare to get his iMac at standing height. My approach was decidedly low-tech. My family owns a bunch of Ikea’s BILLY-model bookcases, each of which comes coupled with a “height extension unit”—an extra shelf topper. (You can buy the toppers directly from Ikea for $10.) I used two, one for my iMac, and one for my second monitor, and the units do a great job at elevating the screens to my standing eye-level. I used a small folding tray table for my keyboard and trackball; its one advantage over the shelf-toppers is that it offers easier access to the desk space underneath and behind it. Note that just because you're standing, doesn't mean you can ignore the principles of good ergonomics. I had to experiment until I made sure I'd found a position that kept my arms parallel to the floor, wrists straight, keyboard and mouse in close range, and so on. That was the extent of my initial setup. I remained standing and got to work. Admittedly, standing-whilst-typing felt a bit odd at first. But after an hour or two, the fact that I was standing slipped my mind: I simply worked. To answer your question, yes: My legs got pretty tired for the first few days. But I was surprised to discover that while my legs adjusted to the increased standing relatively quickly, the aching in my feet got worse each day. I work from home, and I soon realized that my traditional, be-socked approach wouldn’t cut it were I to continue my grand standing experiment. I started wearing sneakers, which helped—but not enough. I bought gel inserts to boost arch support, which also improved things… but my feet were still sore. I bought an inexpensive “anti-fatigue mat.” The combination of sneakers, inserts, and the mat finally soothed my tired feet. Mostly. The other key for extended comfort while standing is adjusting my position. I rotate through standing more heavily on one foot, leaning against the desk, or even resting an arm on the table my keyboard sits upon. 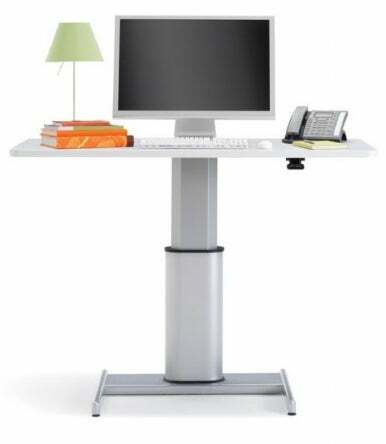 All that shifting around is a good thing: “Perhaps the greatest benefit of a standing workstation for computer work is the ability to change posture, which varies muscle activity [and] should reduce fatigue.” That’s according to Paul Schwab, a board-certified ergonomist and the Ergonomics Program Manager for Texas Instruments. Via e-mail, Schwab expressed his preference for adjustable-height desks, over my fixed-height setup. A quick search will turn up oodles of adjustable-height models from companies such as Anthro, Ergo In Demand, Relax the Back, and Steelcase, many of which are pricey. But, as Schwab says, “Even ardent proponents of standing workstations want to sit occasionally.” That’s the biggest weakness with my barebones setup. I have a tall stool I sit upon for conference calls or when I just need a break. The rare times that I do sit, though, I find that I stand up again after just a few minutes. Sitting now feels like too lackadaisical a position for computer work. Such a thought would never have crossed my mind even one day before my standing experiment began. At slow speeds, treadmill desks such as this one from Steelcase let you keep your muscles moving while typing or talking on the phone. There’s one more option that I’m eager to try: The treadmill desk, which is exactly what it sounds like. If you stick to walking around one mile per hour, it’s reportedly possible to use your computer or talk on the phone—burning extra calories all the while. 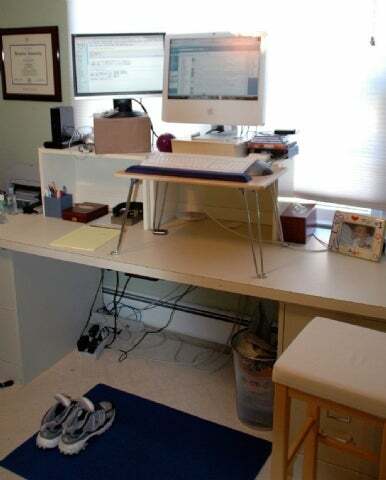 You can find plenty of treadmill desk kits online. There are treadmill-ready desktops you can place over a standard treadmill if you already have one. Alternatively, you can get a flat treadmill that slips under an elevated desk. The technology is there—the major barrier is the startup cost involved. But even standing alone burns extra calories, and studies have shown standing and moving around more during the workday leads to slimmer waistlines. Overall, I’m quite pleased with my shift to standing. I find I’m able to stay focused for longer stretches, and far less likely to succumb to distraction. When I’m standing up, I genuinely feel like I should be working. And I definitely don’t suffer now from the post-lunch crash—it’s tough to fade away into your chair if you’re not sitting in one. On the other foot, I do feel notably more tired by the end of the workday than I did before. Professor Hedge estimates that standing requires 20 percent more energy than sitting, and that certainly catches up with me. Even several months into my standing experiment, I find that I’m going to sleep 30 to 60 minutes earlier than I did previously. But the positives thus far overshadow the negatives. I’m delighted with my new desk setup, and can’t envision going back to sitting full-time again. I just couldn’t stand for it. Frequent Macworld contributor Lex Friedman lives in New Jersey with his wife and two young daughters. Lex tweets with some regularity, and blogs with none. His feet are admittedly a little tired.